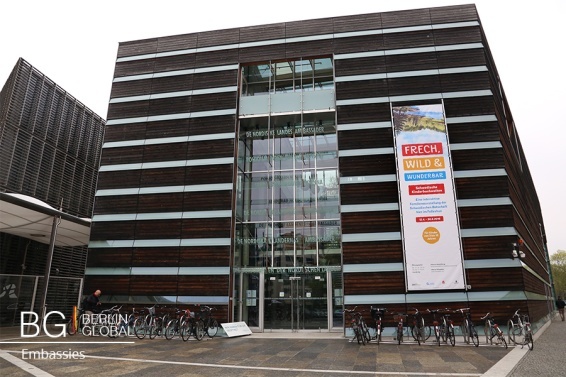 Berlin Global had the pleasure to take a closer look into the Grosses Treffen event, held on 16 April 2016 in Fellenhus, Nordic Embassies, in Berlin. This event is one of the unique examples of collaboration between five embassies and professional artists and curators. The Art Director of Grosses Treffen, Solvej Helweg Ovesen gave an interview for Berlin Global about the occasion. Grosses Treffen is the brainwork of Solvej Helweg Ovesen. Ovesen has had a long career as a curator in Denmark and Germany. 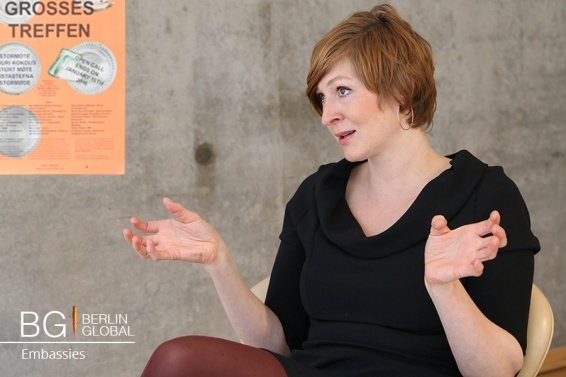 Five years ago, she was approached by one of the embassies to create an event that could be relevant for artists in the Nordic Embassies in Berlin. Because Ovesen’s interests is on arts, not on nationality, she came up with the idea of joint event by all five Nordic Embassies in Berlin. “I decided to look at the diplomatic platform that the embassies are. What kind of power could artists gain form this? I worked from 2012 and came up with this concept of speed dating where the artists actually use the power of the embassies to meet the curators they want to meet.” Grosses Treffen is a professional network event for curators and new contemporary artists to meet and connect. Ovesen sees this event as a possibility for curators, and embassies, to meet and learn about new artists. Ovesen emphasizes the content oriented direction they have taken with Grosses Treffen compared to economic orientation that has still influences the funding of arts and culture. Berlin has a strong role in this event as it is the host of the embassies. The city is described as a gateway for artists to gain more space to present their work and gain more contacts. Berlin is a huge city with curators, gallerists, residency, hosts, festivals, journalists, and other participants. “We are lucky since in Berlin, there is always something interesting going on, new curators and exhibition spaces opened every year in the city, and continues programs arranged by established institutions. And the funny thing is that people who work on established programs and those who create the new, it is important to create an exchange between those curators. Those people are not always far from each other, they visit to each other’s exhibitions sometimes, yet at GROSSES TREFFEN they really meet and spend time together." In Berlin, artists have opportunities to meet other artist from all around the world and work with inspiring people. On the question of the achievements of previous years Ovesen referred to exhibitions artists have held in Berlin, the relationships formed between curators and artists. “In our newsletters we have made the Happy Matches Stories. There you can see which artists have gotten solo shows or group shows here in Berlin.” As a result to the meetings some artists have moved to Berlin to pursue their careers. As for others, with a curator in Berlin, they can continue to work in their own country, but still have a change to present their work in Berlin’s art scene.